He was found covered in bite marks. 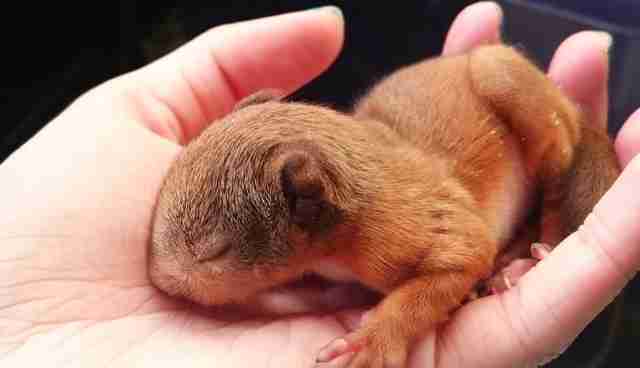 A woman was out walking her dog in Buckie, Scotland, when she came across a sad sight - a tiny baby red squirrel lying in the middle of the sidewalk, all alone and covered in bite marks. The woman knew she couldn't just leave him there, and so she took him to a local pet store, hoping they could help. 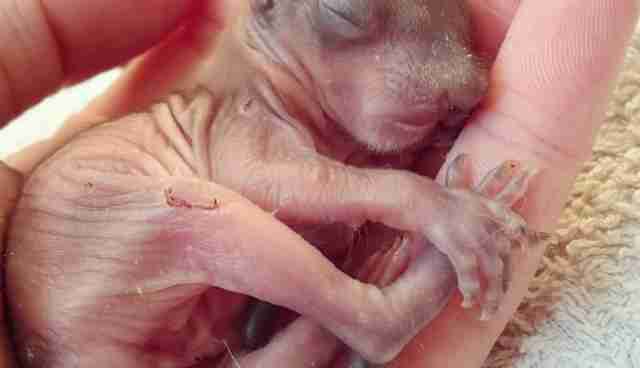 The poor little guy was close to death, and desperately needed someone who knew how to care for him. The pet store quickly contacted the North East Wildlife & Animal Rescue Centre (NEW ARC), which immediately agreed to take him in. 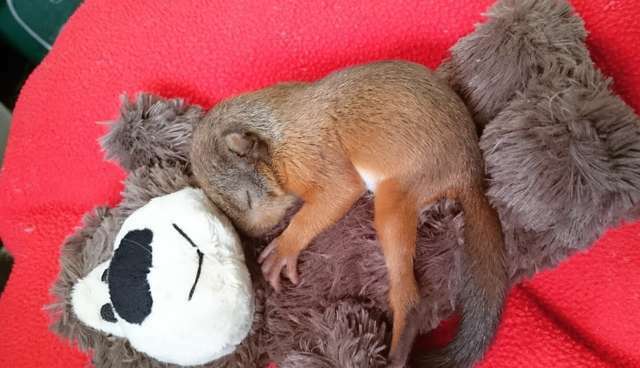 "He came in just 4 days old, covered in bite marks probably from a pine marten that raided the nest," Melissa Noble of NEW ARC told The Dodo. "We really didn't think he would make it as he was so young and the bites were a worry for internal infection." Staffers at NEW ARC quickly set about treating the orphaned baby, giving him milk every two hours and keeping him safe and warm in an incubator. Miraculously, the little squirrel began to regain his strength, and is now thriving. 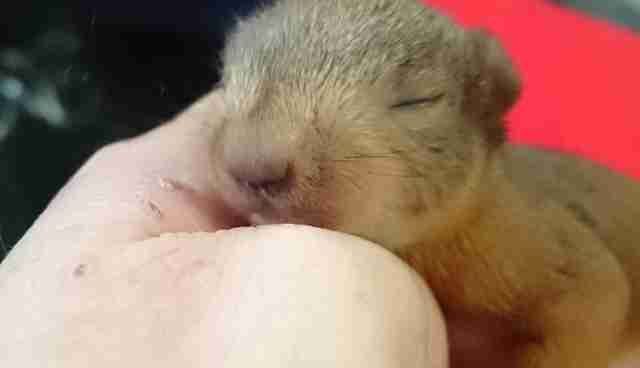 The center doesn't currently have any other squirrels in its care, because it's nearing the end of the breeding season, and staffers were worried the baby squirrel might be feeling lonely without his family to keep him company. He's so young that he still hasn't even opened his eyes yet. "Normally we get a few in from the same litter, but since he's on his own, that's why I bought him a teddy to cuddle," Noble said. "It gives him comfort since he doesn't have any siblings to cuddle into." 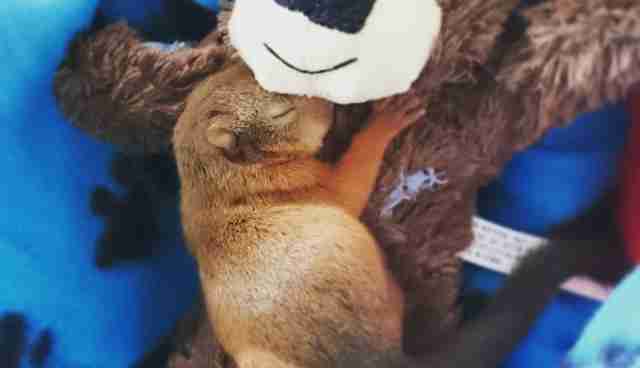 The little squirrel absolutely loves his new teddy bear companion, and will use it to feel safe and loved until he can finally be released back into the wild. 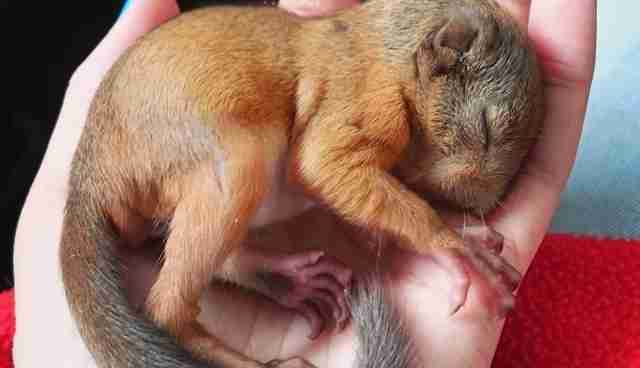 "Once he's older he'll be transferred into an enclosure until he is fit for release in the local area where red squirrels are abundant," Noble said. Found an orphaned or abandoned wild animal? Find out what you can do to help.